The corn bulls need either a US summer weather problem, and thus corn yield loss, or a spring weather problem, and thus winter wheat yield loss. However, a major US weather pattern change lies ahead, and our work suggest an increasing likelihood that HRW yields reach at least trend in 2017. The coming boost in soil moisture is pretty well known, but the extent that it affects yield is less known. 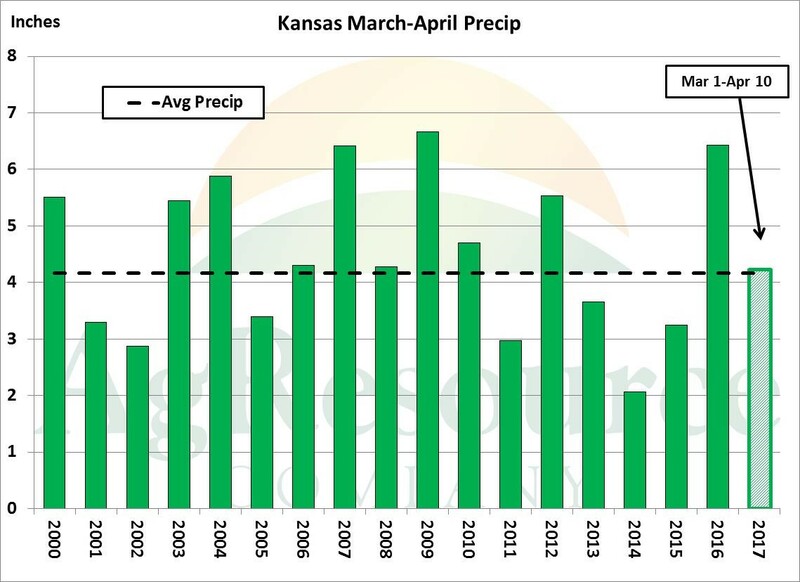 The graphic above displays rainfall accumulation across Kansas in the week of March, and in the just the last 3 days of the month, precip totals will exceed wheat normally falls for 30 days. Assuming the 3-day forecast is correct – which it often is – Kansas’ statewide average rainfall during the month will reach 2.75”. Then, assuming the two-week forecast is correct, March 1-April 10 rainfall will reach 4.25”, which is right on par with rainfall normally seen throughout the months of April and March. 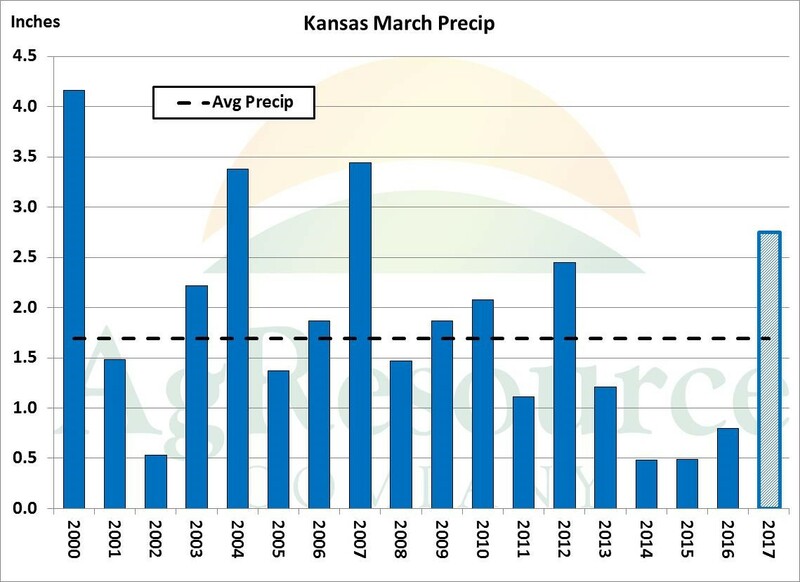 Some low-level flood risk is noted, but available moisture will otherwise go a long way in sustaining plant health throughout spring, and the risk of 2014-like wheat yields in KS will be more or less erased. And, indeed, even early spring moisture does correlate loosely with yield. 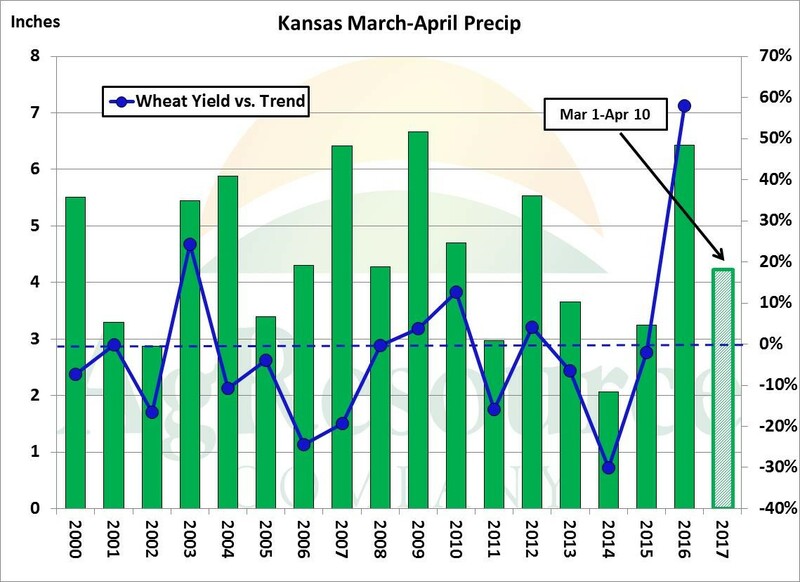 The graphic above displays March-April rainfall (including this year’s forecast), as well as whether Kansas’ HRW yield was above or below trend, and wheat spring typically correlate with yields at or above trend. Another 8-10 weeks of crop-critical weather lies ahead, but we bring this up because a fairly dramatic drought is needed to adequately draw down US HRW supplies. Recall ending stocks (or new crop beginning stocks) are pegged at a record 567 Mil Bu, and using trend yield and trend demand, HRW stocks in 16/17 will stay perched at 475-500 Mil Bu – and thus competition for feed use between wheat and corn will stay elevated. The markets keep waiting on adverse weather to show up, but so far it hasn’t. And, finally, to get a full recap and in-depth analysis of this week’s stocks and seedings numbers, sign up for a 7-day trial at agresource.com/research-matters. *We will only use your email to send you occasional updates on Midplains Ag.